David Austin's English Roses need no introduction. Like many other gardeners I've become totally captivated by the old-fashioned look of these beautiful roses. I love them! At one eager, early stage at Mooseys I thought I'd try and have a complete collection - every one ever introduced into New Zealand. I've since learned moderation, but I'm always on the lookout for new varieties. Some David Austin roses grow tall in New Zealand gardens, so I often plant them against a fence, or some other support. Some older varieties have sadly failed me (like the fragile Heritage) while others like Graham Thomas grow beautifully. The flower colours are amazing, particularly the subtle pastels. The rose names are evocative, too: Strawberry Hill, The Prince, Fisherman's Friend... I hope you'll find your favourite English rose in my David Austin rose collection. If it's not there, well perhaps I could get it for my garden! Not another pastel pink fluffy English rose? Yes, I've made room for David Austin's 'Strawberry Hill' rose, and I'm rather glad I did. Strawberry Hill is almost weather-proof, too, in my windy garden. Last Mother's Day was a terribly exciting time - my family told me to buy new roses for my garden, as a present. And so I ordered some striped roses and David Austins (fifteen, actually). One of these is the pretty pastel Lichfield Angel. I've offered a good country home to six Glamis Castle roses. They're white David Austin English roses, named after a famous castle in Scotland. It's my bad luck that all my beautifully fragrant Sharifa Asma roses are situated far away from garden seats and paths. It is a David Austin rose, and rivals Othello for perfume. Sharifa Asma is in my opinion one of his very best, particularly in its autumn colouring. Some years ago I rescued my first John Clare (a David Austin English rose) from the bargain bin at a local nursery. I'm so glad I did! The pink is deep yet soft, and seems to glow - especially in the late afternoon sun. These two lordly English roses have been growing in my rose garden for some years now. Of course they're both named after two famous English composers - Sir Benjamin Britten and Sir Edward Elgar. When I was buying climbing roses for the archways in the orchard I wanted fragrance, fragrance, and fragrance. There were a few early casualties, and one of the first replacements was the David Austin English rose called Crown Princess Margareta. I get the David Austin roses all mixed up - particularly the group who have girl's names (Mary rose excepted, since she's my namesake). My latest plan is simple - leave the girlie labels on! And so with confidence I can welcome Ellen rose to the Moosey collection. William Shakespeare is one of my favourite playwrights. But the rose that bears his name has been unspectacular in my garden - until the summer of 2009, that is. Teasing Georgia is one of the latest David Austin English Roses to grace my garden. She's a subtle charmer, with flowers of the most beautifully soft marmalade yellow colour. If I was only allowed to grow one David Austin rose I think I'd choose the beautifully fragrant Othello. His perfume is absolutely gorgeous - whether in the garden or in a vase inside the house. The Pilgrim was one of my early yellow rose purchases. It is a so-called English rose bred by David Austin, and the flowers are a soft lemon colour. The Pilgrim has a subtle and understated beauty. Graham Thomas was one of the very first David Austin roses that I bought for the garden. I didn't realise then how big he would grow, but luckily I planted him alongside the house fence. Phew! Room to breathe and spread. David Austin has bred many beautiful white roses like this one, called The Nun. I rescued her from a bargain sale table, but her first flowering season was a disaster (the flowers balled in the rain). I know this is the David Austin rose Gertrude Jekyll by her sweetly scented pink flowers and the picture on the label. But in my garden these roses don't grow well if they are crowded with other plants, and I've had to move them several times. Redcoat is one of the early David Austin English roses. I have two shrubs which used to grow in a mixed border. They were far too straggly, so I shifted them to lean on a small fence by the woodshed - much better. Mary Rose should be my favourite rose, for the name if nothing else! This was my first David Austin rose, purchased when I knew very little about roses. 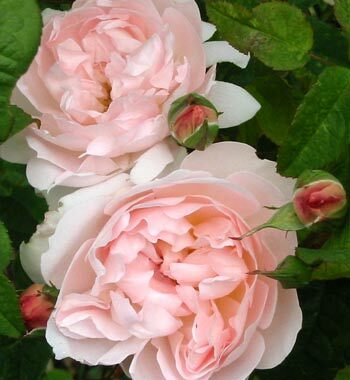 The idea of an English Rose was appealing to me as an ex-pat, and Mary Rose promised a soft pink flower. I've been worshipping the wrong Golden Celebration rose for years, as a result of an incorrect label. Hopefully I can put things to right - this is the real one with golden egg-yolk yellow flowers. Pat Austin is one of the most beautiful of the tall David Austin English shrub roses, and must be named for someone in the breeder's family - yes, it's his wife. She (the rose, I mean) has huge flower-heads which are packed with apricot-tangerine petals. Back in 2004 Geoff Hamilton was the latest David Austin English roses to join my garden. In his first summer he decided to bloom beautifully. The flowers were light pink, and very pretty, in an old-fashioned rose way. I think of Constance Spry as the mother of all English roses - these were introduced to the rose world by Englishman David Austin. I have one Constance Spry which sprawls over the fence behind the Septic Tank Garden. Abraham Darby is a well-established David Austin rose, and one of the first luscious peachy pastels to be planted in my garden. It is one of the strongest growing and most beautiful English roses, and so suitable for New Zealand gardens. The Alexandra rose is a single David Austin rose with delicate pink and soft yellow single flowers. My books tell me it should be useful in a mixed border. My Alexandra rose is a bit straggly in its present position, and is taking part in the next Great Autumn Shift. Either the books and the label are both wrong about the Molineux rose, or my nose isn't working any more. I can't smell any scent on this beautiful yellow David Austin rose, though I'm assured it has a strong tea rose fragrance.